Blimey I’m a tired lady builder today, I think the last week’s catching up with me. Mind you, it’s only a week since I was groggy from a general anaesthetic, so it’s little surprise really. Add that to industrial strength antibiotics & emerging sniffles and I’m definitely feeling very grumpy, resulting in a bit of an epy over something totally insignificant and even the bloke in the brick yard clocking my mood. Early night tonight methinks. Happy when I look at what’s happening on site though. One of the wonderful things about the house I live in is it’s eclectic nature, things have been added on and expanded in years gone by, something I really like. I’m absolutely sure that the massive chimney stack at the end of the West Wing was not originally sitting on the of the stables as it just seemed far too ornate and towered above the original building rather like an elaborate show off addition. 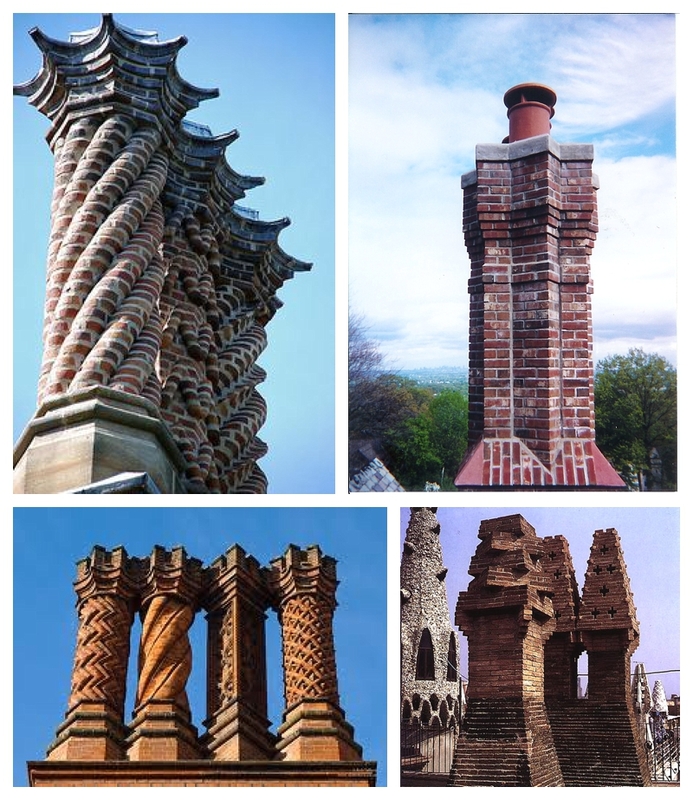 Maybe I’m wrong, I don’t know but regardless of it’s originality, it had an extremely dangerous lean going on, with the weighty chimney pots and upper bricks courses liable to topple over on a blustery Manchester day. It’s hard to see that from the ‘before’ pic below but trust me, lean it did. As so much work around the gable was being undertaken we decided to drop it down by about half to ensure it’s long term stability. It isn’t used a s a working chimney by either next door to our rear or ourselves, so lowering it wasn’t a practical issue. All the bricks were saved and carefully put to one side. Top Tip: Be sure to do this when you’re demolishing and mark different piles as it’s so easy to get them confused and forget which pile is which. 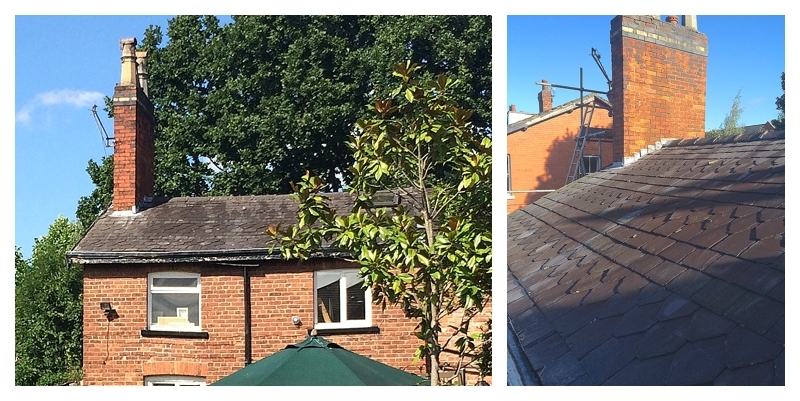 Finally it was time this week to get a scaffolding tower up and re-lay the black and yellow banding of decorative brick, then the two courses of red before popping the pots back on. I made myself a bit unpopular as they forgot to put the two top courses of red on and mistakenly popped up the pots straight on the black band. It looked awful and didn’t match the other stacks so I had to insist it be re-done. 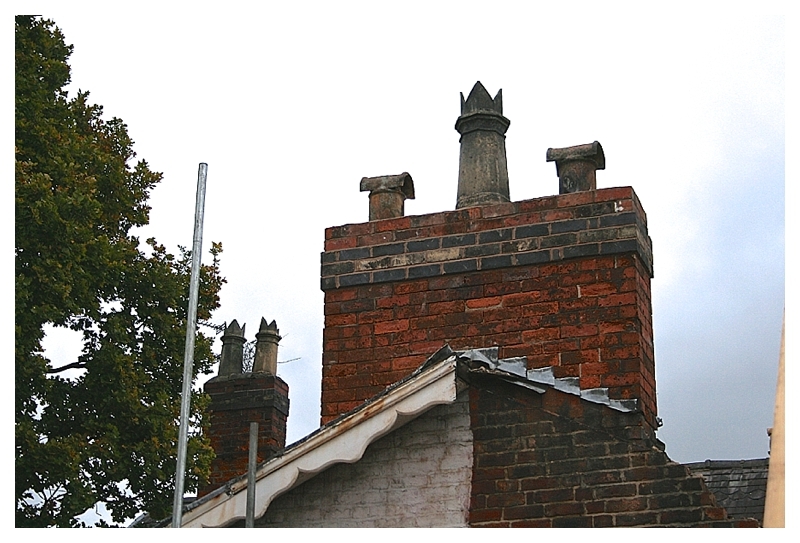 They had to be taken down the next day, 40 red bricks carried up, the pots removed, the mortar scraped off and re-fitted after the top two red courses of brick had been incorporated. It’s the little things. I’m sure that’s what the brickies were saying about me… i.e. that little thing better keep outta our way…. 😉 One of the original pots was so heavy it was damaged in removal and I’m very much looking forward to creating a special place for it in the garden to pop a plant in, watch this space. 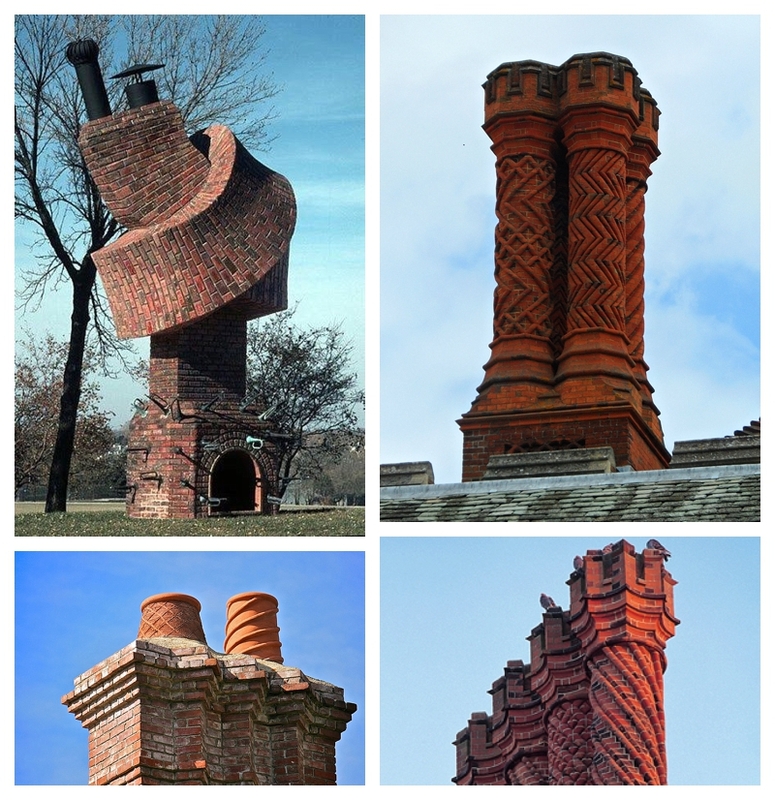 That is one whopper of a chimney you’ve got. It’s really got some presence hasn’t it!? Love it! Pingback: Harnessing the Hygge or, How To Pick A Wood Burning Stoves | MOREGEOUS... Making Homes More Than Gorgeous! 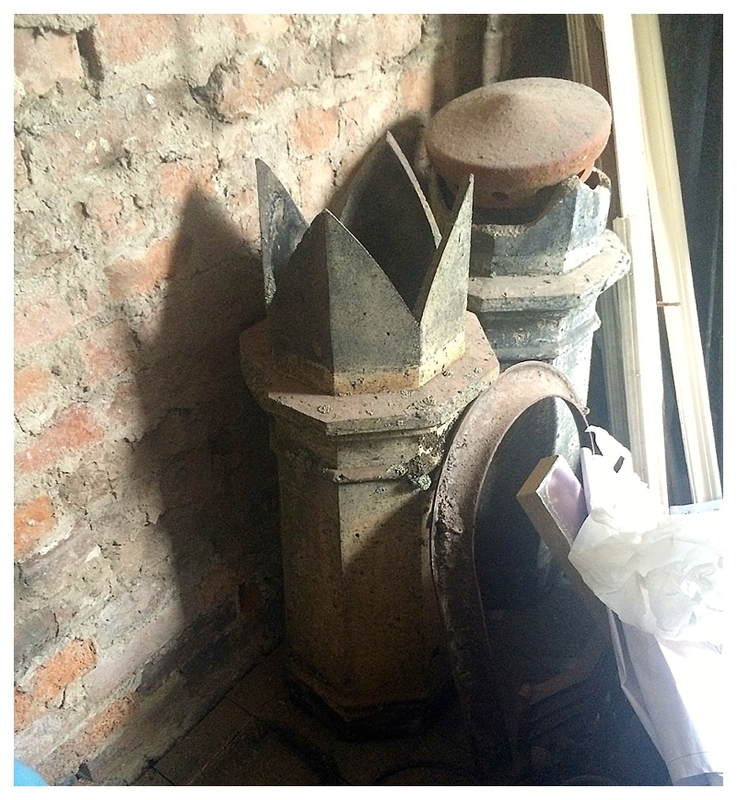 Pingback: Harnessing the Hygge, To Stove Or Not To Stove | MOREGEOUS... Making Homes More Than Gorgeous!